"The Legend of Shi" begins with an track that, at first, sounds like the introduction to a anime or the like. It's almost incidental film score music, with Japanese spoken word vocals setting the tone. A little more than halfway through that track, however, things get kicked up about 100,000 notches when the band kicks in and you realize, "Oh, this is where wer're going." What follows are ten tracks of pounding guitar, rap-style vocals and some real imagination. There are crushingly heavy tracks (my personal favorite, "Kozo," which is basically a duet with a demon), there are as-close-to-a-ballad-as-you'll-get tracks (the still-pretty-far-from-a-ballad "Step by Step"); and there are fast and furious tracks (another one of my favorites, "This is Crossover.") There's even a track that's heavy on the Beastie Boy influence, at least at the first listen, in "Teenage Rage." I must admit, I'm not typically a fan of that particular vocal style, but it's not a deal-breaker either. 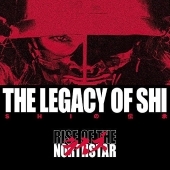 And Rise of the Northstar have an undeniable energy and performance style that I find truly refreshing. Theirs is a fast-and-loose style rather than tight-and-technical and I love that. Plus their lyrical content, as on the above-mentioned "Kozo" is wildly creative and unique. I'm pretty sure fans of the band's previous work are going to love this album, as will anyone else who's a fan of metal and rap-style vocals. Even if you're not, give this album a chance. There's a lot here worth listening to. For more information, check out https://www.facebook.com/rotnsofficial.